Polymyositis (PM) is an autoimmune muscle disease characterized by oligoclonal T cell infiltrates mediating myocytotoxicity. Although antigenic triggers for this process remain undefined, clinically homogeneous subsets of PM patients are characterized by autoantibodies directed against nuclear and cytoplasmic Ags that include histidyl-tRNA synthetase (Jo-1). Available evidence suggests that formation of anti-Jo-1 autoantibodies is Ag-driven and therefore dependent on CD4+ T cells that may also direct cytolytic CD8+ T cells involved in myocyte destruction. To assess peripheral blood T cell responses to Jo-1, we first subcloned full-length human Jo-1 as well as novel fragments of Jo-1 into the maltose-binding protein expression vector pMALc2. Expressed proteins were then used in standard proliferation assays with either PBMC or autologous DCs as sources of APCs. Although PBMC-derived APCs and DCs both supported peripheral blood T cell proliferation when primed with full-length human Jo-1, only DCs promoted proliferative responses to a unique amino-terminal fragment of Jo-1. mAb blockade of different HLA Ags revealed that these responses were MHC class II dependent. Therefore, for the first time, these studies demonstrate anti-Jo-1 T cell responses in Jo-1 Ab-positive PM patients as well as in healthy control subjects. More importantly, this work underscores the critical importance of APC type in dictating T cell responses to a novel antigenic fragment of Jo-1. Polymyositis (PM)3 represents an autoimmune disease in which muscle is inappropriately targeted for immune-mediated destruction (1). Extramuscular manifestations include vasculopathy (Raynaud phenomenon), arthritis, dysphagia, cardiac dysfunction, and interstitial lung disease (2). Because the antigenic trigger(s) for this process remain unknown, current therapy relies on nonspecific, global immunosuppression with agents such as prednisone, methotrexate, tacrolimus, and cyclosporine (3, 4, 5, 6). While the latter two calcineurin antagonists preferentially target activated T cells, developing more specific immunotherapy requires the identification of Ag-specific effector cells that drive the immune response in this disease process, because these cells represent potential targets for elimination or anergy induction. In fact, different subsets of PM exist that are defined by characteristic clinical features and autoantibodies directed against particular nuclear and cytoplasmic proteins such as Jo-1 (histidyl-tRNA synthetase; 7, 8). Given the strong genetic associations between such myositis-specific Abs and MHC class II alleles (9, 10, 11), the autoantibodies in PM likely stem from an Ag-driven Th cell response. Support for the primary role of T cells in promoting specific autoantibody responses comes from work in other diseases such as scleroderma, systemic lupus erythematosus, anti-phospholipid Ab syndrome, and immune thrombocytopenic purpura (12, 13, 14, 15, 16, 17). Moreover, in the T cell-mediated autoimmune disease primary biliary cirrhosis, bile duct-infiltrating T cells and a subpopulation of peripheral blood CD4+ T cells recognize the same Ag (pyruvate dehydrogenase complex) that is targeted by a highly stereotypical, but nonpathogenic, Ab response (18, 19, 20, 21). Paralleling the example of primary biliary cirrhosis, immunohistochemical studies in subsets of PM defined by specific autoantibodies have demonstrated an oligoclonal T cell infiltrate directly invading nonnecrotic muscle fibers (22, 23, 24). Although the Ag(s) triggering this process remain undefined, the aforementioned paradigms of autoimmune disease suggest that, in Jo-1 Ab-positive (Jo-1+) PM, T cells targeting Jo-1 both drive autoantibody formation and mediate the cellular mechanisms of myocyte destruction implicated in this disease process. Establishing this pathogenic connection through identification of disease-associated T cells will be critical in defining Jo-1 as a relevant autoantigen and in designing novel therapeutic strategies targeting Jo-1-specific T cells. As an important first step in this process, this study used in vitro priming of Jo-1-specific T cell responses with recombinant full-length Jo-1 as well as internal fragments of this protein. One critical variable controlling the ability to activate Jo-1-specific T cells is the type of APC used to prime peripheral blood T cells. Although these studies demonstrate that APCs present in PBMC generate variable responses to recombinant full-length human Jo-1, monocyte-derived dendritic cells (DCs) expanded in vitro with GM-CSF and IL-4 universally stimulate anti-Jo-1 T cell proliferation in both Jo-1+ PM patients and healthy control subjects. More importantly, because DCs also promote proliferative responses to fragments of Jo-1, their use has permitted initial mapping of Jo-1-specific T cell epitopes. Eight patients with Jo-1+ PM and nine healthy control subjects were included in this analysis. The Jo-1+ PM group were all Caucasian and included two males and six females with an age range of 27–79 years. These patients were identified from the University of Pittsburgh PM database and met the criteria of Bohan and Peter (25) for PM based on clinical characteristics, supportive biopsy specimens, and the presence of Abs directed against Jo-1. The control group consisted of five males (four Caucasian and one Asian) and four females (all Caucasian) ranging in age from 27 to 53 years. Demographic characteristics and use of immunosuppressive medications are summarized in Table I⇓. cDNA encoding full-length human Jo-1 was generated via RT-PCR using total RNA isolated from a control subject as a template and random primers for the reverse transcription step. Jo-1-specific primers linked to PstI restriction sites were then used for cDNA amplification by PCR; resulting products were digested with PstI and subcloned into the maltose-binding protein (MBP) expression vector pMALc2 (New England Biolabs, Beverly, MA) previously digested with PstI and treated with calf intestinal phosphatase to prevent religation. Potential clones were subjected to automated sequencing by the University of Pittsburgh core sequencing facility, and resulting products were compared with the previously published sequence for human Jo-1 (26). Overnight cultures of appropriate bacterial clones were expanded to a volume of 1 liter at OD600 of 0.4–0.6 in Luria Broth supplemented with ampicillin (100 μg/ml) and subsequently stimulated with isopropyl-1-thio-β-d-galactoside (0.3 mM) for 2 h to induce protein expression. Lysates generated following two rounds of freeze/thawing and seven cycles (30 s/cycle) of sonication were then subjected to affinity purification using amylose resin as previously described (9). Western blot analysis using polyclonal anti-Jo-1 serum (Immunovision, Springdale, AK) or monoclonal anti-MBP Ab (New England Biolabs) confirmed the identity of the fusion product. 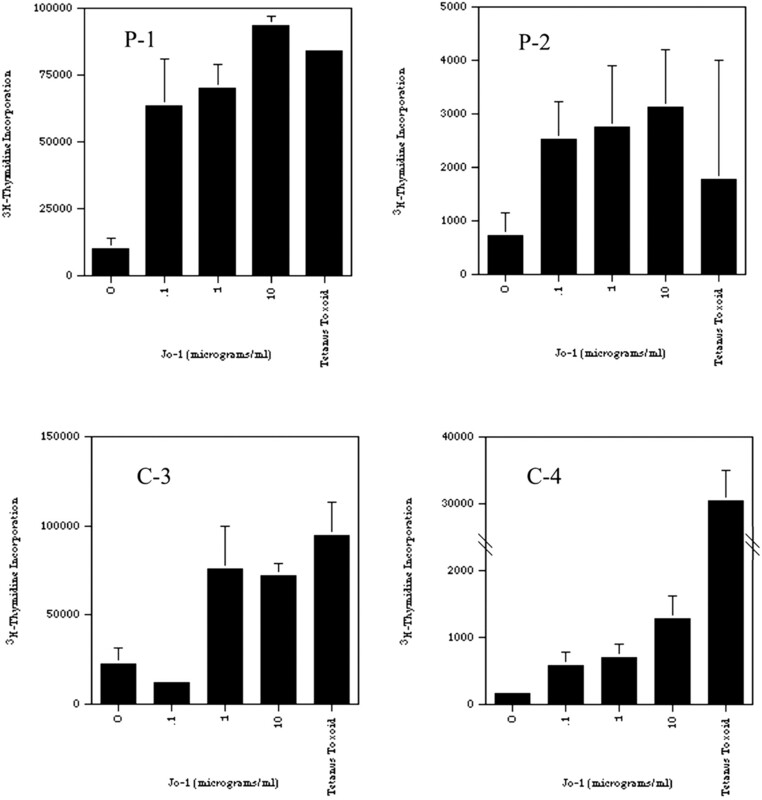 Double immunodiffusion assays using the polyclonal anti-Jo-1 serum as well as control serum derived from a Jo-1+ PM patient were conducted to assess the three-dimensional integrity of B cell epitopes and, by extension, proper folding of Jo-1. Factor Xa cleavage of the full-length Jo-1 fusion protein in column buffer supplemented with 2 mM CaCl2, followed by MonoQ anion-exchange chromatography (Amersham Pharmacia Biotech, Uppsala, Sweden) and dialysis in TBS (20 mM Tris-HCl and 140 mM NaCl; pH = 7.4) yielded purified preparations of full-length human Jo-1. Overlapping Jo-1 fragments ∼150 aa in length were generated as MBP fusion proteins after PCR amplification using PstI-linked internal primers and full-length Jo-1 template DNA. Following sequence confirmation, bacterial expression and purification of fusion proteins were performed as above. The resulting protein products were not cleaved with Factor Xa and therefore were retained as fusion proteins. PBMC were isolated from heparinized blood samples using Ficoll-Paque (Amersham Pharmacia Biotech) density centrifugation according to established methods. Lymphocytes were cultured at 37°C and 5% CO2 in RPMI 1640 (Life Technologies, Rockville, MD) containing 10% heat-inactivated human AB serum (Sigma-Aldrich, St. Louis, MO), 2 mM l-glutamine, 100 U/ml penicillin, and 50 μg/ml streptomycin. To obtain DCs, mononuclear cells were initially plated in AIM-V serum-free medium (Life Technologies) for 2 h followed by removal of nonadherent lymphocytes. Adherent cells were cultured in AIM-V supplemented with IL-4 (30 ng/ml; Life Technologies) and GM-CSF (20 ng/ml; BD PharMingen, San Diego, CA) for 7 days with the supplementation of medium and cytokine on day 4. Resulting DC preparations were then harvested through manual cell scraping after incubation in PBS containing 15 mM EDTA for 20–30 min at 4°C. DCs generated by this method were typically 90–95% pure as determined by flow cytometric analysis for expression of CD11c, CD80, CD86, MHC class II, and the absence of monocyte marker CD14 (data not shown). No significant differences in DC yield or cell surface phenotype emerged between patients and control subjects (data not shown). PBMC obtained following Ficoll-Paque density gradient centrifugation were plated in 96-well flat-bottom plates at a concentration of 1 × 105 cells/well. These cells were cocultured with various Ags in triplicate wells at the specified concentrations for 7 days in RPMI 1640 supplemented with 10% AB serum, 2 mM l-glutamine, 100 U/ml penicillin, 50 μg/ml streptomycin, and (where indicated) 20 U/ml IL-2 (IL-2 was used to augment proliferation in PBMC experiments demonstrating globally reduced T cell responses to all Ags, including the positive control tetanus toxoid). [3H]Thymidine (1 μCi/well) added for the final 16–18 h of culture then permitted quantification of nucleotide incorporation through liquid scintillation counting. For purified full-length human Jo-1, SI were calculated as a ratio of [3H]thymidine incorporation with Jo-1 divided by [3H]thymidine incorporation without exogenous Ag using values representing the mean of triplicate wells (SI = mean cpm Jo-1/mean cpm no Ag). Similar calculations were used for uncleaved MBP-Jo-1 fragment fusion proteins using [3H]thymidine incorporation for MBP alone (at equimolar concentration) as the denominator (SI = mean cpm MBP-Jo-1 fragment/mean cpm MBP). SI >2 were considered positive. In experiments using DCs, 1 × 104 DCs/well (96-well plate) were initially pulsed with Ag for 16–24 h in the presence of AIM-V medium containing IL-4 (30 ng/ml), GM-CSF (20 ng/ml), and TNF-α (2 × 103 U/ml; BD PharMingen). Following removal of this medium, 1 × 105 nonadherent lymphocytes (∼70–80% T lymphocytes, data not shown) were added in RPMI 1640 supplemented with 10% AB serum. Cultures were maintained for 5–7 days before a 16-h pulse with [3H]thymidine (1 μCi/well) and liquid scintillation quantification as described above. mAbs directed against HLA-DP (IgG3), HLA-DQ (IgG2a), HLA-DR (IgG2a), or HLA-A/B/C (IgG2a) (all obtained from Leinco, St. Louis, MO) were preincubated with Ag-pulsed DCs in RPMI 1640/10% AB serum at a concentration of 20 μg/ml for 4 h before addition of lymphocytes. Cultures were then maintained for 5–7 days (in the continued presence of blocking Abs at a final concentration of 10 μg/ml) before assessment of [3H]thymidine incorporation. Because the functional analysis of Jo-1-specific T cell responses requires abundant amounts of Jo-1 protein, the preliminary phase of this work involved cloning, sequencing, expression, and purification of both full-length human Jo-1 and fragments of this protein. With total RNA from a random human control subject as a template, RT-PCR was performed using sequence-specific primers fused to PstI restriction sites. The full-length product was subsequently cloned into the bacterial expression vector pMALc2 containing 5′ sequences encoding MBP (Fig. 1⇓A). Following isopropyl-1-thio-β-d-galactoside-stimulated protein expression and amylose resin purification, the fusion protein was subjected to Factor Xa cleavage and anion-exchange chromatography for removal of the MBP tag (Fig. 1⇓B). 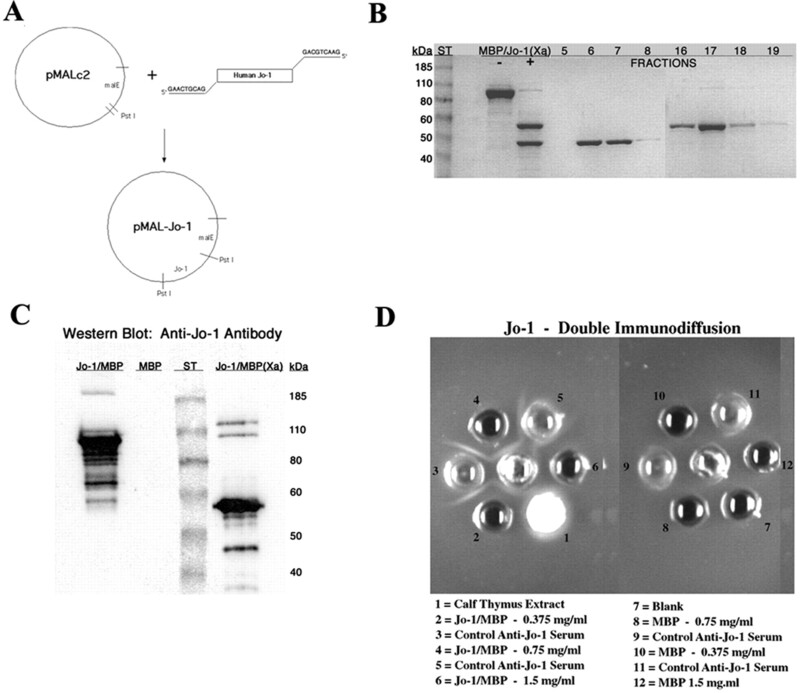 Western blot analysis and double immunodiffusion assays were performed to confirm the structural integrity of the MBP-human Jo-1 fusion protein. Examination of Fig. 1⇓C shows that polyclonal anti-Jo-1 serum identifies a ∼55-kDa band corresponding to denatured, full-length Jo-1. Because the same serum (as well as control serum from a Jo-1+ individual) also recognizes nondenatured Jo-1 in double immunodiffusion assays (depicted in Fig. 1⇓D), the recombinant protein expressed in Escherichia coli preserves the conformation of functional B cell epitopes. Cloning and expression of full-length human Jo-1. A, Cloning strategy following RT-PCR amplification of human Jo-1 using specific 5′ and 3′ primers to generate PstI restriction sites for insertion into the polylinker site of pMALc2. B, Coomassie-stained SDS-polyacrylamide gel (8%) of the MBP-Jo-1 fusion protein pre- and post-factor Xa cleavage, as well as fractions collected from a MonoQ anion-exchange column. The ∼55-kDa upper band represents full-length Jo-1, as indicated by the Western blot probed with polyclonal anti-human Jo-1 Ab shown in C. D represents a double immunodiffusion assay using defined amounts of Ag, control anti-Jo-1 serum, and purified polyclonal Jo-1 Abs (center wells). 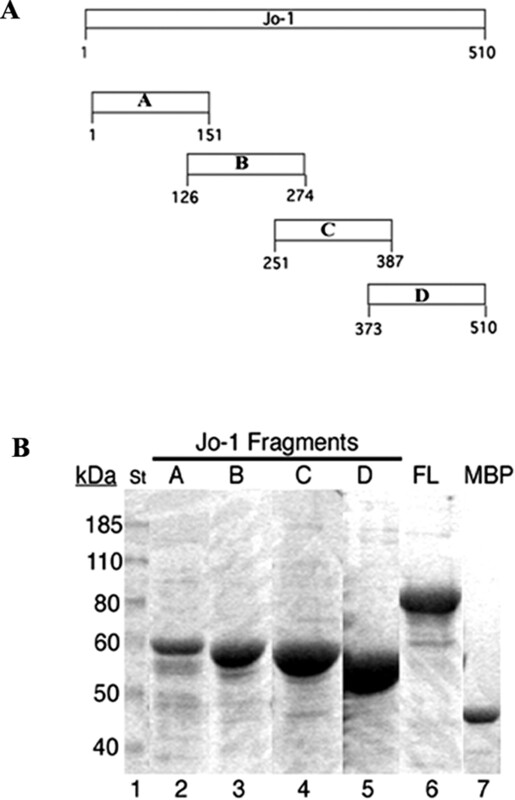 For the generation of MBP-Jo-1 fragment fusion proteins, overlapping sequences of Jo-1 were amplified by PCR using internal primers and full-length human Jo-1 as template DNA (Fig. 2⇓A). Each of these fragments was of the expected size on Coomassie blue-stained polyacrylamide gels (Fig. 2⇓B). Cloning of Jo-1 fragments fused to MBP. A, Appropriate 5′ and 3′ primers containing PstI restriction sites were used to PCR-amplify overlapping Jo-1 protein fragments using full-length human Jo-1 as template. The resulting DNA products were subcloned into the PstI site of pMALc2, assessed for misincorporation by automated sequencing, and expressed as MBP fusion proteins. B, Coomassie-stained SDS-polyacrylamide gel (10%) of Jo-1 protein fragments A–D fused to MBP (lanes 2–5), full-length Jo-1 linked to MBP (lane 6), and MBP alone (lane 7). As shown in Fig. 3⇓, PBMC isolated from peripheral blood of both Jo-1+ PM patients and nondiseased controls proliferate in a dose-responsive fashion to purified full-length Jo-1. Although seven of eight Jo-1+ PM patients responded to full-length human Jo-1 presented by PBMC-derived APCs, five of nine control subjects also demonstrated proliferative responses to this Ag (Table II⇓). Stimulation index (SI), calculated as [3H]thymidine incorporation following Jo-1 priming divided by [3H]thymidine incorporation without addition of exogenous Ag, varied widely and did not clearly differ between Jo-1+ PM patients and control subjects. The number of patients available for this analysis did not permit statistical correlation between SI and variables such as disease duration, concomitant use of immunosuppressive medications, or age. Jo-1-induced proliferation of PBMC. 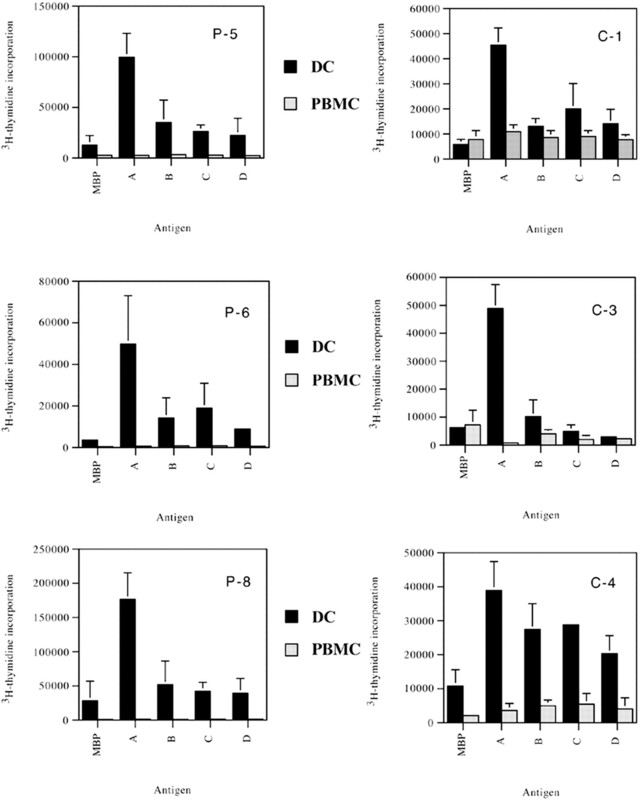 Isolated PBMC (1 × 105 cells/0.2 ml) were stimulated for 7 days with varying concentrations of purified full-length human Jo-1 and then pulsed for 16 h with [3H]thymidine; tetanus toxoid and “no Ag” were used as positive and negative controls, respectively. All cells were cultured in RPMI 1640 supplemented with 10% AB serum, penicillin/streptomycin, and human rIL-2 (20 U/ml). Bars represent mean values of [3H]thymidine incorporation for 3–6 wells. P, Jo-1+ PM patients; C, nondiseased controls. To begin defining Jo-1-derived T cell epitopes, Jo-1 fragments were used in proliferation assays with DCs or PBMC as a source of APCs. Of note, fragment A—consisting of the amino-terminal 151 aa of Jo-1 fused to MBP—consistently produced the highest SI compared with MBP-induced background proliferation, though other fragments variably stimulated proliferation in Jo-1+ PM patients and control subjects (Fig. 4⇓ and data not shown). Table II⇑ summarizes the SI generated by either full-length human Jo-1 or the amino-terminal fragment A with different APC types. Although both PBMC-derived APCs and DCs were capable of presenting full-length Ag in a productive fashion (also shown in Fig. 5⇓), only DCs promoted proliferative responses to Jo-1 fragments (Fig. 4⇓). Amino-terminal fragment of Jo-1 presented by DCs stimulates T cell proliferation. DCs cultivated for 7 days in the presence of IL-4 (30 ng/ml) and GM-CSF (10 ng/ml) were pulsed with the indicated Ag for 20–24 h in AIM-V medium containing IL-4, GM-CSF, and TNF-α (2 × 103 U/ml) before the addition of autologous, nonadherent lymphocytes at a concentration of 1 × 105 lymphocytes/well of a 96-well plate. Cocultures of Ag-primed DCs and lymphocytes were maintained in RPMI 1640 medium supplemented with 10% AB serum for 5–7 days and then pulsed for 16 h with [3H]thymidine. For PBMC cultures, 1 × 105 mononuclear cells isolated by Ficoll-Paque gradient centrifugation were coincubated with Ag for 7 days in RPMI 1640 medium supplemented with 10% AB serum and then pulsed for 16 h with [3H]thymidine. Solid bars indicate the mean of triplicate samples for each Ag condition with DCs, while hatched bars represent mean values for whole PBMC cultures. Patient and control subject identifiers correspond to designations outlined in Table I⇑. Ags include MBP (7–10 μg/ml) and MBP-Jo-1 fragment fusion proteins A–D (each at 13 μg/ml). DCs present full-length Jo-1 more efficiently than PBMC. DCs cultivated for 7 days in the presence of IL-4 (30 ng/ml) and GM-CSF (10 ng/ml) were pulsed with full-length Jo-1 (10 μg/ml) or no Ag (No Ag) for 20–24 h in AIM-V medium containing IL-4, GM-CSF, and TNF-α (2 × 103 U/ml) before the addition of autologous, nonadherent lymphocytes at a concentration of 1 × 105 lymphocytes/well of a 96-well plate. Cocultures of Ag-primed DCs and lymphocytes were maintained in RPMI 1640 medium supplemented with 10% AB serum for 5–7 days and then pulsed for 16 h with [3H]thymidine. For PBMC cultures, 1 × 105 mononuclear cells isolated by Ficoll-Paque gradient centrifugation were coincubated with Ag for 7 days in RPMI 1640 medium supplemented with 10% AB serum and then pulsed for 16 h with [3H]thymidine. Solid bars indicate the mean of triplicate samples for each Ag condition with DCs, while hatched bars represent mean values for whole PBMC cultures. Patient and control subject identifiers correspond to designations outlined in Table I⇑. Although the specificity of the proliferative response to Jo-1 fragment fusion proteins was internally controlled through comparison to MBP-induced proliferation (effectively eliminating the contribution of MBP or nonspecific factors such as bacterial LPS), demonstrating MHC class II dependence was essential in confirming that this Ag-driven process was mediated through the TCR. Therefore, proliferation assays were repeated in the presence of mAbs blocking HLA-DP, -DQ, or -DR. mAbs recognizing HLA-A/B/C served as an additional control for MHC class I-mediated CD8+ T cell proliferation. Fig. 6⇓ clearly demonstrates that responses to full-length Jo-1 and fragments of Jo-1 are mediated primarily via MHC class II based on blockade of proliferation by anti-HLA-DR mAbs in representative Jo-1+ PM patients and control subjects. Despite this dependence on HLA-DR, the limited number of patients and control subjects in this study did not permit correlation between specific genotypes (e.g., DR3; see Table I⇑) and T cell proliferation stimulated by either full-length Jo-1 or Jo-1 fragments. MHC dependence of Jo-1 fragment-induced proliferation. Ag-primed DCs were used to stimulate T cell proliferation as outlined in Fig. 4⇑ in the presence or absence of HLA-blocking Abs at a concentration of 10 μg/ml. Each bar represents the mean of triplicate samples quantitated by [3H]thymidine incorporation following a 16-h pulse. Ags include MBP (10 μg/ml), MBP-Jo-1 fragment A fusion protein (13 μg/ml), and full-length Jo-1 (10 μg/ml). Through analysis of in vitro proliferative responses to full-length Jo-1 as well as Jo-1 fragments, this work conclusively demonstrates for the first time that T cells isolated from Jo-1+ PM patients and control subjects recognize Jo-1. In both Jo-1+ PM patients and control subjects, the proliferative response to full-length Jo-1 is enhanced by DC processing and Ag presentation that obviates the need for exogenous IL-2, which is occasionally required with whole PBMC cultures (Fig. 5⇑ and Table II⇑). Given that DCs likely represent the most efficient type of APC with the capability of stimulating naive T cells, this result is not surprising (27). More striking is the absolute dependence on DCs for productive presentation of Jo-1 fragments, as PBMC-derived APCs are incapable of promoting proliferation when primed with Jo-1 fragments (Table II⇑). Although somewhat variable, fragment-induced proliferation reveals a predominant response to the amino-terminal fragment A, indicating a major T cell epitope in a region that contains previously demonstrated dominant B cell epitopes (28, 29, 30). Finally, the Ab-blocking experiments depicted in Fig. 6⇑ clearly show the MHC class II (HLA-DR) dependence of proliferation driven by full-length Jo-1 as well as Jo-1 fragments. Demonstrating Jo-1-specific T cell responses represents a key step in establishing the hypothesis that Jo-1 drives T cell-mediated autoimmunity in Jo-1+ PM. Although many of the putative autoreactive T cells are likely sequestered/concentrated in diseased muscle, peripheral blood is a readily accessible source of T cells for assessment of Jo-1-specific proliferation. Previous work with PBMC-derived lymphocytes in other autoimmune disorders (including multiple sclerosis, topoisomerase I+ scleroderma, immune thrombocytopenic purpura, and β2GP-1+ anti-phospholipid Ab syndrome) has validated the methodologic approach used in this work for assessment of Ag-specific T cell responses (12, 13, 14, 15, 16, 17, 31). From these studies, one emerging concept is that both patients and healthy controls possess T cells capable of proliferating in response to specific autoantigens. In the case of topoisomerase I-, GIIb-IIIa-, and β2GP-1-reactive T cells, this response is clearly MHC class II restricted (12, 13, 16, 17). Because in vivo Jo-1 Ab production also correlates closely with defined MHC class II region products involved in Ag presentation to T cells (e.g., DR3 in Caucasians) (9, 10, 11), the ability of PBMC derived from Jo-1+ PM patients and healthy controls to proliferate in response to Jo-1 will also likely overlap in an MHC class II-restricted fashion. As in the aforementioned disease models, differentiating patient- and control-derived Jo-1-reactive T cells will require assessment of precursor frequency, phenotype (Th vs T cytotoxic), cytokine profile (indicative of Th0, Th1, or Th2 phenotype), kinetics of activation (reflecting in vivo activation state), and ability to stimulate in vitro autoantibody production (12, 13, 16, 17, 31). Although the limited number of control subjects included in this work precludes correlation of HLA genotype with in vitro T cell proliferation, the occurrence of Jo-1-induced T cell proliferation in control subjects suggests that disease expression may ultimately hinge on alterations in Ag presentation rather than T cell repertoire alone. The mere presence of autoreactive T cells in control subjects with different HLA-DR genotypes is not necessarily surprising given the wide range of TCRs available on circulating, naive T cells. However, with further definition of the TCRs involved in PM and the antigenic forms that they recognize, significant correlation between HLA type, epitope specificity, and disease state may become more apparent. Underscoring the critical role of Ag presentation, the DC experiments depicted in Figs. 4–6⇑⇑⇑ and summarized in Table II⇑ clearly demonstrate that the type of APC can profoundly influence Ag recognition. In fact, comparison of T cell proliferation induced by fragment A or full-length Jo-1 reveals that, in a number of responders, the absolute value of [3H]thymidine incorporation for fragment A (after subtraction of the MBP background) greatly exceeds that of the full-length protein—but only when DCs are used as the APC source. These results parallel findings in topoisomerase I Ab-positive scleroderma in which the relative response to full-length topoisomerase I and fragments thereof varies dramatically with the type of APC (32). More broadly, this finding is consistent with the concept that certain autoimmune diseases may be initiated by aberrant cleavage of proteins that are normally nonimmunogenic (33, 34). Under a general scheme in which autoimmunity results from a breach of peripheral tolerance, defining the factors that govern the in vivo generation of cryptic epitopes and activation of professional APCs will be necessary to further elucidate the pathogenesis of diseases such as scleroderma and PM. Overall, the existence of defined T cell subsets recognizing Jo-1 in Jo-1+ PM patients is an expected result given the striking Jo-1 autoantibody response that theoretically hinges on Ag-specific CD4+ Th cells. Although we have not directly demonstrated MHC class I-restricted (CD8-restricted) T cell proliferation directed against Jo-1, in vivo CD8+ T cell-mediated myocyte destruction likely occurs in conjunction with T cell help. Based on the previously described paradigm of primary biliary cirrhosis, the Ag specificity of autoinvasive CD8+ T cells in PM may parallel that of Th cells driving anti-Jo-1 Ab formation. Ultimately, however, demonstrating Jo-1-specific T cells within the inflammatory infiltrates of diseased muscle will be critical in establishing a more direct pathogenic link between Jo-1 and the T cell-mediated muscle damage that is a hallmark of PM. We thank Dr. Paul Hu for technical assistance with T cell cultures and Dr. Olivera J. Finn for thoughtful review of this manuscript. ↵2 Current address: Pfizer Global Research and Development, 2800 Plymouth Road, Building 50/160 M, Ann Arbor, MI 48105. ↵3 Abbreviations used in this paper: PM, polymyositis; Jo-1, histidyl-tRNA synthetase; Jo-1+, Jo-1 Ab-positive; DC, dendritic cell; MBP, maltose-binding protein; SI, stimulation index. Oddis, C. V.. 1999. Idiopathic inflammatory myopathies. R. L. Wortmann, ed. Diseases of Skeletal Muscle 45 Lippincott Williams & Wilkins, Philadelphia. Bender, A., N. Ernst, A. Iglesias, K. Dornmair, H. Wekerle, and R. Hohlfeld. T cell receptor repertoire in polymyositis: clonal expansion of autoaggressive CD8+ T cells. J. Exp. Med. 181:1863.